This little board is great for developing hardware projects for beginners or more advanced users wanting to do a simple prototype. 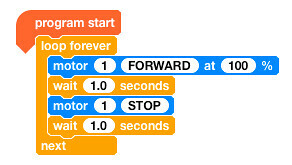 The graphical programming environment has a scratch like feel. This enables the user to feel comfortable and get stuck in to Flashing those onboard LEDs! After downloading the Software. Plugin the cable into the Crumble board. Be careful and ensure that the cable is plugged in the correct way around. Now connect your computer. Note that it does NOT light up to show that it is connected or powered. 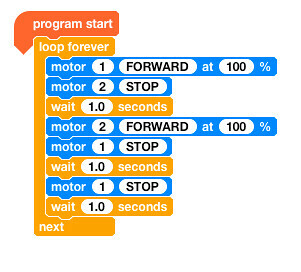 Using the code blocks to create your program. Flashing the onboard LEDs. 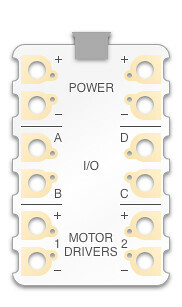 These small LEDs are connected to the section for motors which have the numbers 1 and 2 next to them. Programming the board to turn on 1 LED and then turn it off again. Progressing to Looping the single LED and final alternating between both onboard “motor” LEDS. When teaching this be careful to explain that you will need to use the motor block code as they control the LEDs that are built on the board. This can be confusing for younger learners.